Attorneys representing 14-year-old Ahmed Mohamed, the boy who was arrested after bringing a homemade clock to his Dallas-area school, have sent letters to the school district and the city in which it's located, indicating that Ahmed was publicly mistreated and demanding $15 million in damages, the Associated Press reports. A law firm representing the boy, who was living and attending school in Irving, Texas, at the time of the incident, sent out letters Monday asking for $10 million from the city and an additional $5 million from the Irving Independent School District, threatening lawsuits and also demanding written apologies to the young teen. 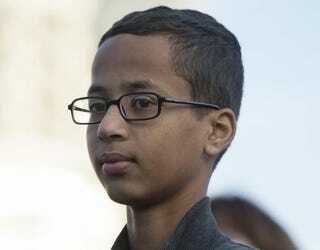 Back in September, Ahmed's story sparked national outrage after he took his homemade clock to school and a teacher raised an alarm, thinking it could have been a bomb. Ahmed was arrested and suspended from school but was ultimately never charged. In the aftermath, the family accepted a foundation's offer to pay for Ahmed's education in Qatar, where they have since moved.